Cndnsd | Food It Yourself! Lots of tomatoes. Not much food storage space. Problem solved by evaporation! Saute onion in a big pot with a little salt and the fat of your choice. I used bacon drippings. Don’t judge my life choices. 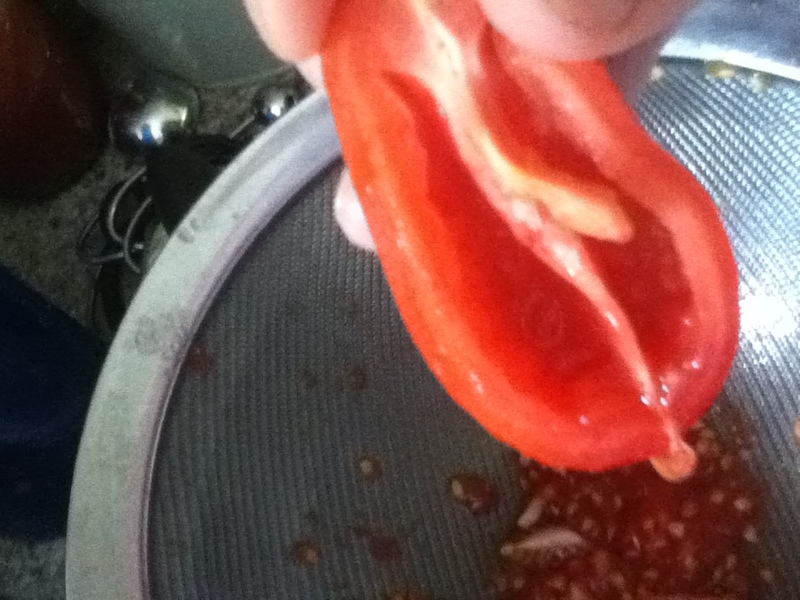 While that’s cooking down, slice two and a half colanders full of tomatoes Splop out the inner seeds and goo. Toss the meaty shells in a blender. Puree the tomatoes and add them to the pot with the onions, maybe add some garlic. No, the presence of peel will not cause the world to end. Yes, you can add other seasonings at this time but note that as the mixture reduces the flavors will concentrate. I’d hold off. I splopped the seeds and goo into a strainer over a bowl. 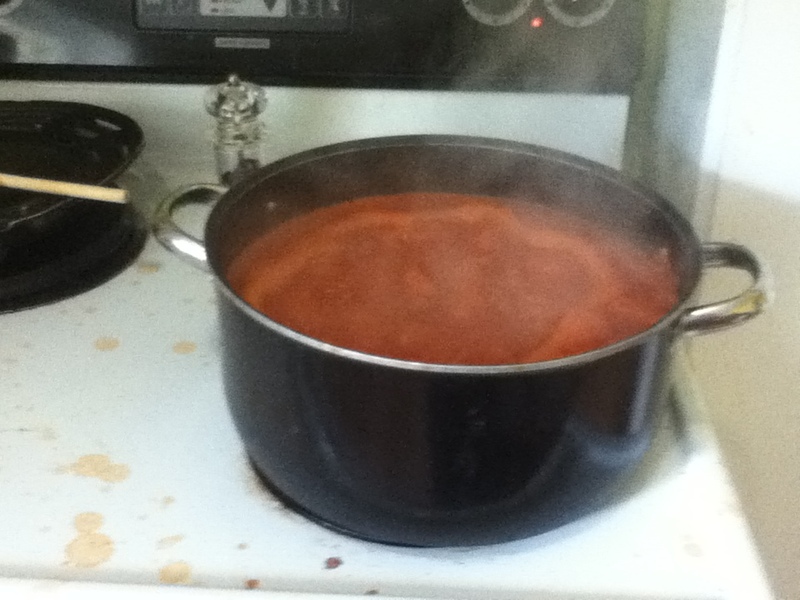 Smoosh the goo through the strainer and add it to the pot with the pureed tomatoes. That goo has flavor. Keep simmering. Here is the same pot; note the time is 4:55pm. Yes, it gets everywhere. 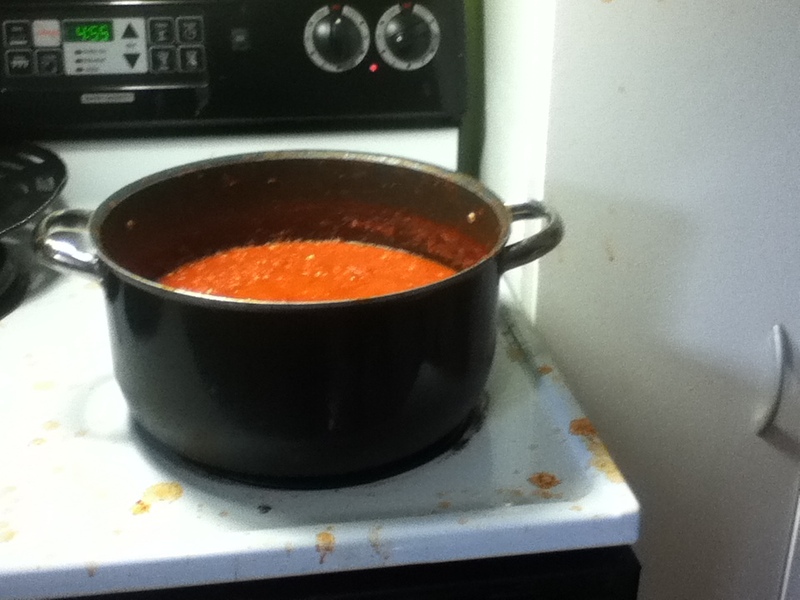 Don’t bother cleaning up until it’s done. Just turn the heat down to control the spatter radius. I switched to a wide cast iron skillet to increase surface area. As it thickens you’ll need to turn the heat lower and lower. That’s it. Note the time is now 8:25pm. What can you do with this amazing paste of concentrated tomato power? Whatever you want. I didn’t even add any other seasonings. Mr. Food It Yourself added it to leftover pasta and declared it “very tasty”. 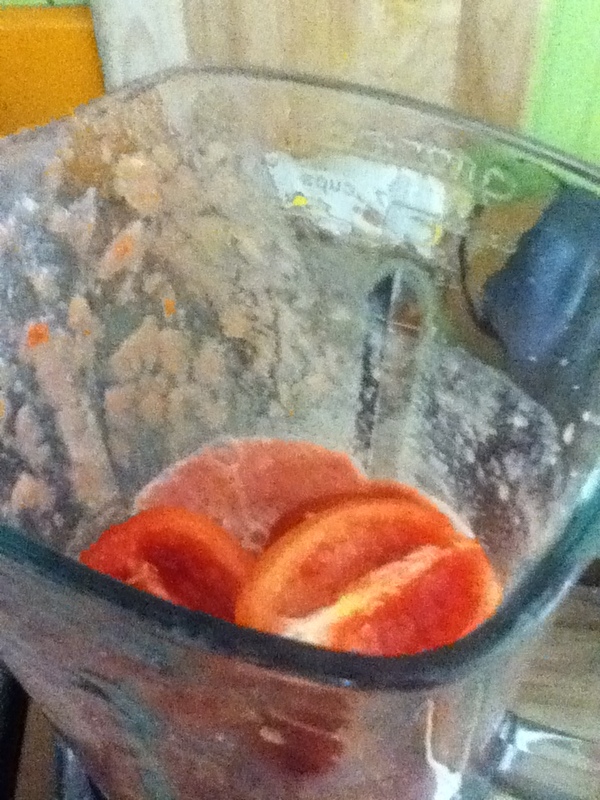 You can mix it with sour cream or yogurt and make a tomato dip. 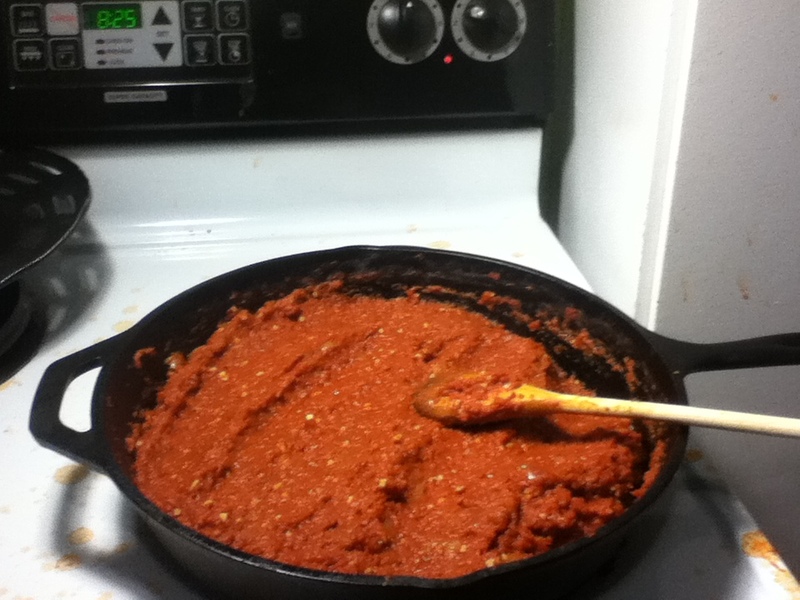 You can use it for pizza sauce. 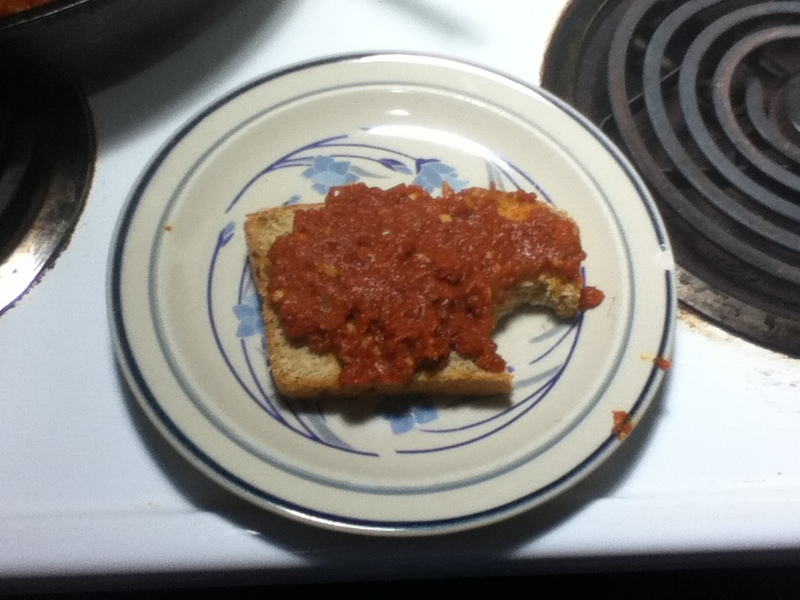 I just smear it on bread. Enjoy! It’s like savory tomato jam! Pingback: Trying to be trendy 2- Cauliflower “Crust” | Food It Yourself!